Kenyan opposition leader Raila Odinga has urged his supporters to skip work on Monday to protest against what he claims were rigged elections that gave victory to President Uhuru Kenyatta. But the government has denounced violent demonstrations as unlawful and urged Kenyans to return to their jobs. 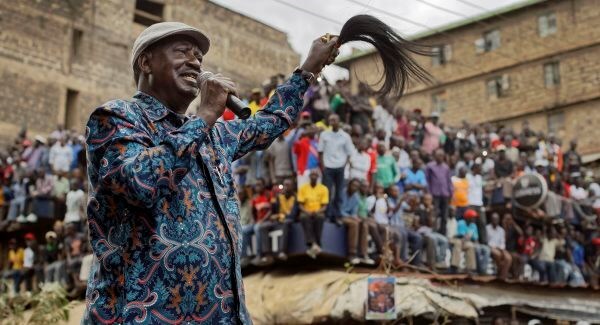 Mr Odinga addressed a cheering crowd in Nairobi’s Kibera slum, an opposition stronghold and a frequent scene of clashes between stone-throwing protesters and police firing live ammunition and tear gas since the August 8 election in which Mr Kenyatta was declared the winner. Mr Odinga’s defiance has fuelled continuing uncertainty in Kenya, an East African economic hub whose reputation for stability has been shaken by election violence and court challenges in the past. “There is no work until Tuesday, when we will announce the next step,” said Mr Odinga, who previously claimed that last week’s vote was rigged and has unsuccessfully run for president on three previous occasions. Kenya’s election commission said its process was fair, and international observers praised its handling of the election. Late on Sunday, machete-wielding members of two rival ethnic groups – Luos and Kikuyus – confronted each other in Mathare, another Nairobi slum, witnesses said. A journalist in the area said he saw a Luo who had a deep machete cut in his head after he was attacked by Kikuyus. While most of Kenya has been calm since the election, the possibility of an outbreak of ethnic violence has been a concern because many Kenyans vote along ethnic lines. Mr Kenyatta is a Kikuyu while Mr Odinga is a Luo. More than 1,000 people died in ethnic-fuelled violence following Kenya’s 2007 election. Mr Odinga was the losing candidate in that vote, and was later made prime minister in a power-sharing agreement designed to defuse tension. The opposition leader’s announcement about his “next step” left Kenyans wondering whether Mr Odinga will press his case that there was vote-tampering and even escalate the situation by calling for protests. One of his deputies previously ruled out the option of going to court, recalling Mr Odinga’s unsuccessful legal challenge after he lost the 2013 election. Some analysts believe it is unlikely that he would effectively acknowledge defeat at this stage. Mr Odinga’s call for followers not to work on Monday will test his ability to mobilise his support base; it could also lead to tension if some supporters try to stop other people from going about their daily business. Police gunfire has killed at least 24 people since the election, according to the state-funded Kenya National Commission on Human Rights, which monitors government institutions. However police denied the report on Sunday, saying police have killed six “criminals” who were looting, rioting and attacking police officers in the past two days.